I can't hardly sleep these past few days. We are now experiencing a nuclear catastrophe and more aftershocks every half hour or less, rolling blackouts since yesterday pa and it looks like the news of radiation leak at the Fukushima nuclear plant has sparked panic buying in Tokyo and other cities... Oh my Gosh I hope maging maayos na lahat.... Let's continue to pray for Japan, we need all your prayers!! We all know that God is in control of the situation.. and even if we can't see any good out of the situation.. Let us trust in His goodness and love for each of us. I am praying for you and for Japan..
Know that Jesus Christ loves you..
Continue to have faith Mommy Jacris! that's really terrifying. last night we shot a prayer for Japan and the people when hubby and I were praying together. but believe that God is in control. i'm grateful to hear that you were not physically hurt. 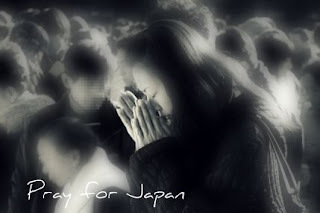 We are and be always praying for Japan, Jac, I am also hoping it would be alright soon. Just hang on and more than anything else, this is the right time to call HIM and I believe HE will not forsake you he never forsake anyone even what culture or race they are. Keep the Faith Jac. Hope you get back to blogging na ulit kahit mga memes lang. Nakagawa kana ba ng photoblog? Talk to u soon sis mwah. Hope everything is fine now there in your end mommy jac. we'll keep praying for all the people in japan.